An Arrow video from The CW takes viewers "Inside: Brothers in Arms"
As a special treat, the person doing this week’s video is Co-Executive Producer Beth Schwartz, she of “Texts From Mom” fame. Also, Lyla (Audrey Marie Anderson) is back! Check out the video below. If you have not yet seen the preview images from this week’s show, you can find them underneath the clip. 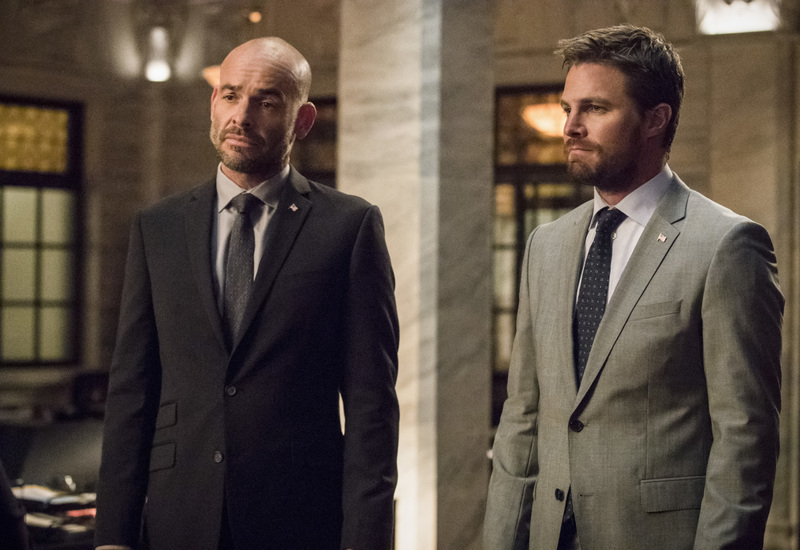 Arrow -- "Brothers in Arms" -- Image Number: AR617b_0302.jpg -- Pictured (L-R): Paul Blackthorne as Quentin Lance and Stephen Amell as Oliver Queen/Green Arrow -- Photo: Jack Rowand/The CW -- ÃÂ© 2018 The CW Network, LLC. All rights reserved.